I love, love, love making homemade granola. It’s such a lovely breakfast treat that makes getting up at the crack of dawn for my ol’ day job a little more bearable. The granola flavor I’ve been enjoying this week? Pumpkin-raisin. Yeah, I’m a little time-warped back into fall with this one, I know. But in my defense, I wanted to create a granola totally different from the other ones I’ve done (see the recipes for the delicious Chocolate-Cherry and Protein-Packed Peanut-Butter ones I created earlier this year), and I had this large container of canned pumpkin that I’d bought in the fall and never used, so I thought, what the hell? The result was a richly flavorful, filling granola that is just as enjoyable in June as it is at pumpkin-patch time. Preheat oven to 325 degrees. In a large mixing bowl, combine rolled oats, pumpkin seeds, walnuts, raisins, coconut, sea salt, and cinnamon. To a medium saucepan, add pumpkin, honey, coconut oil, and grapeseed oil. Heat over medium-low heat, stirring constantly, for about two minutes, until it’s achieved a smooth, well-melded consistency. Then mix immediately with the dry ingredients. Once granola is well mixed, spread it out evenly over a large cookie sheet and bake for 50-55 minutes. To help ensure even baking, stir granola after 20 minutes and then 40 minutes have elapsed. Once granola is well-toasted without being overly done, remove it from the oven and let cool before scooping into a well-sealing container. Now you’re ready to enjoy the scrumptious gloriousness of fall without all the impending winter-is-coming doom-and-gloom you can’t help but feel at that time of year! Granola should keep well for at least a week. 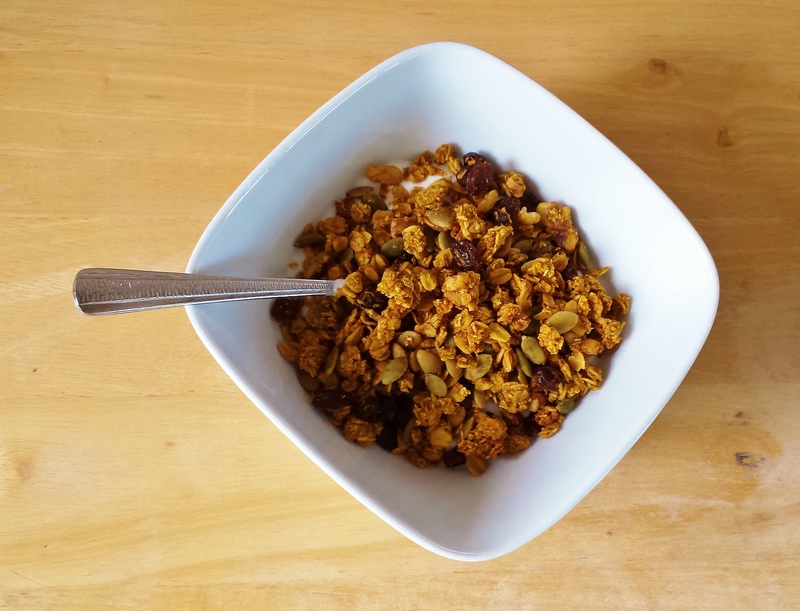 This is one of your best creations…love the granola! !